And the verdict is...boy it's slow growing in Northwest Oregon! I'm a week behind with posting. Last weekend proved to be cool with spots of sunshine and the goldfinches have arrived to provide some cheery music outside. 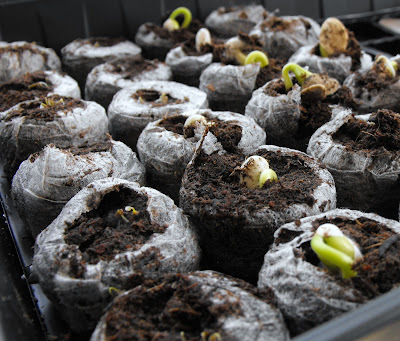 My indoor sowing was a week old and the kiddos were delighted to see we had some results. This is the first year I have ever attempted to start some seeds indoor, rather than just purchasing the starts from the stores in late May. This weekend, the starts have progressed enough to transfer them to pots. Here's hoping for healthy happy little beans, squash, pumpkins and zucchini. I am concerned by this cool spring though. Not sure how these plants will fare down the road outside. 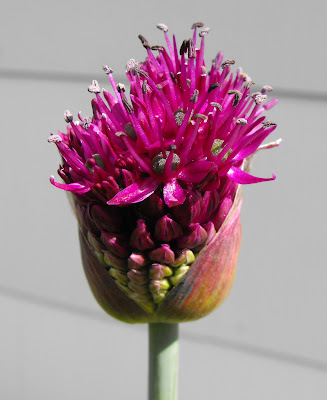 I snapped this photo of my allium opening. This is my first year with alliums in the flower gardens. Ok, let me restate. These are the first I've planted. I have some in the yard that I've not been able to fully get rid of that have a strong onion like odor. I'll post about them another time. I see the clematis is producing some nice looking, large buds. The lilacs in the back hedge are also showing color, but no blooms yet. The summer perennials like Shasta daisy's are growing very healthy, as are the Asiatic lilies. I keep crossing my fingers that this cool, cool spring will let up. 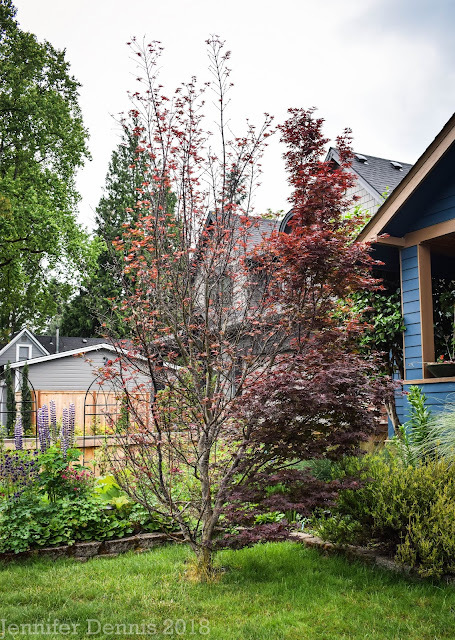 This mother's day weekend, my gardening projects include, creation of the 'wood cutters' garden, as the plants I ordered are in! And, to transfer the indoor sown seedlings to pots to keep them inside a bit longer. Wishing all the Gardening Mothers and Grandmothers out there a very Happy Weekend. Jenni, it all looks wonderful! The 'kiddos' are going to have such fun with those seedlings. 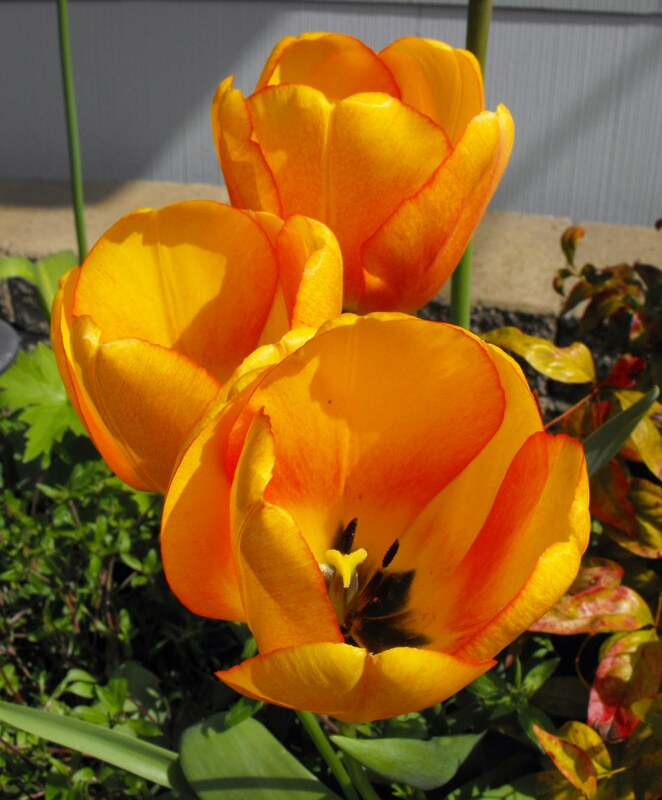 Woke up this morning to crushed tulips etc after the heavy rains and winds, seriously, this weather is exhausting. 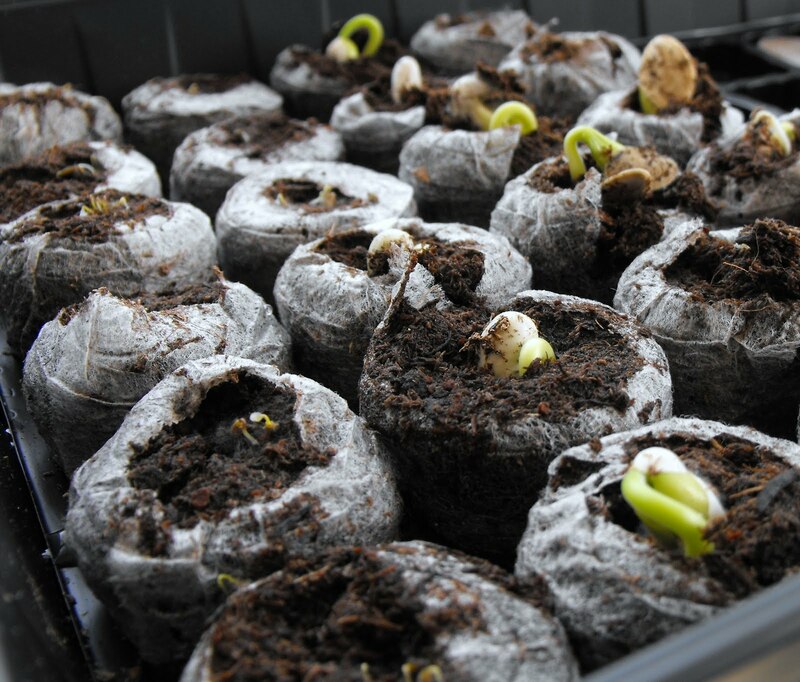 Raising seeds is just so exciting and rewarding - they look great. Hopefully your weather will even itself out over the coming weeks. 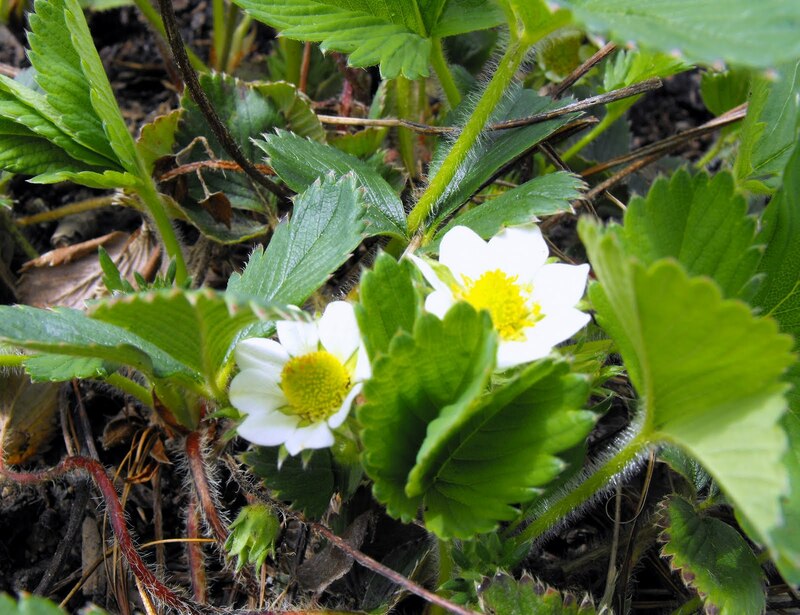 Your strawberries look as if they'll be nice and juicy when they come to fruit.